We haven’t played in a while, but Delaney and I used to play quite a bit of Chutes and Ladders. I’m pretty sure if we played 100 games together, she won about 157 of them. She didn’t seem to quite grasp the concept of getting to go up the ladder but having to go down the chute if you landed on it. She would land on the bottom of a slide, start giggling, and then move her game piece all the way to the top of the chute. Or at least she used to this. She tried it one to many times so I decided to teach her a lesson by breaking her finger. Okay, not really, just seeing if anyone actually reads this. Anyway, leukemia is a lot like Chutes and Ladders. In the game you start cruising along, get to move forward three spaces, and then break the cookie jar because you are a little glutton who should have just said no. Instead of a cookie, you get to slide down about four rows and wonder aloud whether the game will ever end. Well with leukemia, your child is cruising along doing well, puts her hand in a cookie jar, doesn’t realize that some kid with a runny nose beat her to the jar, and that her glutton dad ate all the cookies anyway, which unfortunately left no cookies but plenty of germs for the girl with the low white blood cell count. Instead of sliding down four rows, she ends up back in the doctor’s office or ER getting poked and prodded. Good times. Unlike Chutes and Ladders, the Consolidation Phase actually is coming to an end. We are less than 48 hours away from it being done and done (Two months down and 25 left to go). Out with the old, and in with the Interim Maintenance (I) Phase. Gone will be the three consecutive lumbar punctures and the daily oral chemo. Instead of going every Friday, it will move to every ten days. Even though it seems like we get to spend less time at the doctor’s office, we actually pick up an extra day. They will have to make sure her cell counts are high enough for her to tolerate the type of chemo she will be getting, so she needs to get her labs checked the day before the treatment. One minor bonus of moving from every seven days to every ten days, is she hopefully gets her Fridays back. When the rest of the world was screaming TGIF, Delaney was telling us that she didn’t like Fridays. Cancer or no cancer, I refuse to let a child of mine NOT like Fridays! ~ although we like to tell people we met at church, we actually met at a meat market. Not a meat market as in “Al’s meats” mind you, but a bar so sleazy that you swore you would never go on a single date with anyone you met there. ~On our first date, Stacey had to become like a cross between a ninja and Chuck Norris to deflect my advancing Ralph Furley-like loose lips. ~When we finally did smooch, it had the oh so romantic setting of in the street while standing next to my primered car door. ~ I attempted (unsuccessfully) to get to 2nd base on my parents driveway. ~ In what was a friendly tennis game, she made the mistake of setting me up with an easy lob at the net. In an instant, I turned into Focker, and smashed one directly at her at a speed that John McEnroe himself would have been proud of. ~ Obviously I knocked some sense into her, because we were engaged just 4 months after we met. ~ the first time Stacey met my parents, she was served Mom’s famous lasagna. As sheer luck would have it, lasagna happened to be one of Stacey’s favorite meals. Ummm… Mom, your lasagna tastes a little different tonight, what did you put in it? Oh… Of course… Tofu. Yum! ~We had our bachelor/bachelorette parties in Vegas on the same weekend. We weren’t planning to see each other, but for some reason her slightly inebriated fiancé getting escorted (okay dragged) out of the casino by the nice muscular men caught her attention and we combined parties (note to anyone going to Vegas- the dealers don’t like to be told repeatedly to take the parrot off their shoulders and to “gently place” them elsewhere. — especially when only the slightly inebriated man can see said parrots. ~ we started out in the San Francisco Bay Area where Stacey had to cross the Bay Bridge to get to work every morning. Her car broke down once on the middle of the very heavily commuted bridge at about five on a dark and very foggy morning. When she called her knight in shining armor to come save her, she was met with a resounding zzzzzzzz…. ~ many people have a “5 second rule,” when it comes to meat, I have a “well nothing is growing on it yet” rule. ~Stacey mentioned that she thought the best Mexican food came from “dive restaurants”. For some reason she wasn’t impressed when I took her out on what I thought would be a romantic date to a gas station. ~ I don’t mean to brag, but I am a really good gift giver. Some of the gems that has she has received on special occasions and holidays include a scale and “the gift” of intimacy. ~ nobody confused me with Albert Einstein, when we were running low on formula so I substituted heavy whipping cream in the baby’s bottle. ~ I once won a sales contest that paid for me and a guest to travel through the romantic countryside of Portugal. To this day, Stacey still has never been to Europe as I took one of my brothers on that trip. ~ On our 15th wedding anniversary, I started a special savings account to take her to Greece for our 20th anniversary. I recently changed my language preference on that account to Spanish in hopes that my balance might go from a couple of bucks to muchos pesos. I better stop before all the women reading this attempt to leave their own husbands to find themselves a peach like me. Why in the world am I writing this??? Because sixteen years ago today, I had the privilege and honor of marrying my very beautiful wife. If our relationship has survived all of those things, it’ll survive Delaney’s leukemia. I am not going to lie, cancer is very tough on a marriage. For some reason I don’t think the secret potion on Cupid’s arrows consists of lots of stress, increased irritability, lack of sleep, the feeling of helplessness that you can’t even protect your own family, sadness, fear, and more stress. I remember something our Pastor said to us while we were praying together on Day One of her leukemia diagnosis: he said God had already blessed Delaney with two parents who not only love her, but also love each other very much. He was right. The next day as we were waiting for Delaney to get out of surgery, we started talking to the woman that worked the desk of the post-operation waiting room. As our daughter was getting her port put in, she was telling us about a couple who were in the day before to get their child’s port removed. The mother of that child commented, “We survived.” The waiting room employee mistakenly thought she was referring to her child and said, “Oh yeah, he did great.” The child’s mother corrected her, “No, WE, as in my husband and I, WE survived.” And as they did, we will do also. Later a friend, who is an elder at our old church in Texas, called to say that he and all of the elders were not only praying for Delaney, but also specifically for me and Stacey and that we would be drawn closer together because of what we were going through. Our conversation reminded me that cancer could be a very big problem in a lot of different ways, but it was nowhere even close to being as big as our God. So today, on our 16th wedding anniversary, I just want to tell my wife who has stuck with me as I got thick and thicker, who if possible is more beautiful on the inside than she is on the outside, who is the brains of this outfit, who under that hair dye is as grey as a mule, who puts up with dumb jokes like that, who is such an amazing mother and my best friend and sometimes nemesis, that she is so much stronger than she realizes and that I love her even more today than I did on that day sixteen years ago when she took my breath away as she walked down the aisle. Cancer will not be the end of us. My gas maybe, but not cancer. I love you more than you know and look forward to celebrating about 47 more wedding anniversaries with you. And I am sorry you have to wait so long, but it’ll all be worth it: you are going to just love Greeley. They are home from the ER. They think it was a virus. Thank you for your prayers (again). It’s like a training bra for your wrist! I can tell that I haven’t done a good job of updating the blog when I get questions as to how Delaney’s circus performance went. Sorry about being a slacker (she wasn’t able to make the performance by the way). All in all, she has been doing okay. The daily ups and downs of leukemia continue. Saturday was great. Sunday started out good, then at about lunchtime she wasn’t feeling well. Since Sunday, she has been getting headaches. This morning she woke up sobbing because she was in so much pain. The doc said to bring her on, so they are giving her fluids through her port right now (he said sometimes kids get headaches after 2-3 lumbar punctures in a row OR it could just be a cold). On a much more exciting note, Delaney’s support bracelets came in yesterday. A special thank you to her classmate Macayla and her entire family for doing all of the work. What was really cool was Delaney got to pick the colors, design, etc. and they turned out great! While I am thanking folks, her Uncle Matt created a website (www.cancercankissmystache.com) to make it easy for people that want a bracelet to order one. Please note that these are Support Bracelets and not Get Rich bracelets. We had to put a price on the website so we put $5, but if you can’t afford that or if you just know a special kid that would enjoy one, please just email prayersfordelaney@gmail.com and let me know and I will be happy to send one off! On that note, he also put a donation link on there. If that is something you are interested in, please let me know if there is a special person or place that I could send some to (Today I gave some to her Doc’s office for their other patients fighting cancer). Considering the amount of school she is missing, we are going to try to make this educational for her by getting a map and having her stick a pin it for every place her “Cancer can Kiss My Stache” message is being sent to. It should be fun! 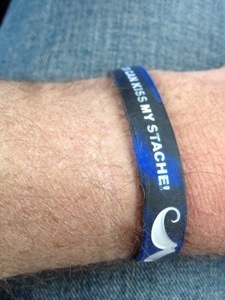 Below is a pic of the bracelet or you can go to http://www.cancercankissmystache.com to see a better pic. Thank you everyone for your continued prayers and support!!! There are many selfish prayers out there. Trust me, I should know, I’ve probably prayed all of them. Today’s prayer request could easily be classified as selfish as I am not praying for world peace (not even whirrled peas) or an end to hunger, today I am just requesting prayers for a clown. Delaney has her last lumbar puncture of the consolidation phase today. It should be identical to last Friday’s chemo treatment, which is part of the concern. After last week’s treatment, she didn’t feel well and was completely wiped out the rest of the day. If the same thing happens today, she’ll probably miss the circus performance that her kindergarten class is putting on this afternoon. After practicing the songs every time we were in the car and actually making the dress rehearsal yesterday, Delaney is all set to be a mustached (shocker) clown today and we are really hoping she can make it. I am guessing that you can still recall your own early performances, I know that I can. Me and Todd Jackson were a horse in Mrs. McGinnis’ 2nd grade play. Not horses, mind you, ONE horse. Todd was the front of the horse and I was… well… maybe things haven’t changed much so let’s just get back to Delaney! Anyway, if she doesn’t feel well enough to perform, it won’t be the end of the world. If she isn’t up to it, we definitely aren’t going to further jeopardize her health by pushing her to go. However, if she is feeling well enough, we would love for her to have about twenty minutes of feeling like a normal kid again. Not necessarily a “brave little girl fighting cancer” kind of normal, but a silly little goofball just singing songs while giggling and having fun with her friends kind of normal. Okay, as I have the news on in the background, I am changing my mind. I am praying for the people of Boston, praying for the victims, the men and women risking their lives, and everyone involved. I am continuing to pray for all those who have recently touched my life with their own battles against cancer. On a purely selfish note, today, I will also be praying for our silly little clown.